With flautist Kudamaloor Janardanan it seems to be something of a mission to give the ragas their right place in music concerts. That was clear as he played such superb ragas as Nattakurinji, Mohanam, Chenchurutti, Sarasangi, and Sankarabharanam. Kudamaloor Janardanan began his flute concert with the raga Nattakurinji set to Rupaka talam. Without the usual lyrics, Janardanan, after a short alaap, began playing the raga as such with madhyamakala swara sancharam. As it progressed shades of Nilambari could also be felt. The raga Mohanam wafted in the air carrying the audience to a sublime level. Set to Adi talam, resembling the varnam `Ninnu kori,’ the raga was accompanied by laya jathi by Kishore. Laya jathi is the oral recital of the syllables like tha dhim tha ka dhim played on the mridangam. This added colour to the raga. Janardanan mesmerised the listeners, mostly foreigners, with his rendition of the raga Chenchurutti. The raga, which evolved from folk tradition, was presented in its pristine form. Janardanan played the pleasing raga without any accompaniment. The raga Sarasangi set to Misrachappu talam was followed by some percussion solo on the mridangam by Vypeen Satheesh and on the ghatam by Unnikrishnan, and laya jathi. Quite distinct from the usual thaniavarthanams in Carnatic music, which lasts for less than 25 minutes and is often monotonous, here it was interspersed with the playing of the flute. Janardanan started with an alaap and gradually brought forth the softness of the raga, embellishing each swara. The emphasis was on melody. The concluding raga of the evening was Sankarabharanam based on the very familiar composition of Harikeshanalloor Muthiah Bhagavathar modelled on the Western notes Ga Ma Ga Ri Ga Sa . True to the flautist’s unconventional style, there was a near total absence of kritis, varnams and tillanas in the concert, enabling the listeners to enjoy the ragas in their pure form. The 90-minute concert was organised by Alliance Francaise de Trivandrum as part of their monthly programme at Vyloppilly Sanskriti Bhavan. For the flautist, it was an unforgettable experience. Not just because of the ambience or the appreciative audience but because he felt he was able to do justice to the charm of the raga by taking it beyond the literary content of the composition. Janardanan considers ragas as “the spirit of Indian classical music.” And as an instrumentalist, he strives to bring to the fore the emotive and expressive quality of the raga in his concerts. 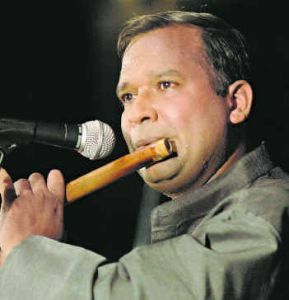 “A kriti like `Nagumo’ became popular not only because of its poetic quality, but because it is based on the raag `Abheri.’ Similarly, `Raghuvamshasudham budhi’ became popular because of the unique features of the raag `Kadana Kuthoohalam,” he contends. Resisting innovation and change and citing tradition as an excuse, hinders the growth of music resulting in listeners losing interest, feels Janardanan. “In Carnatic music, kirthans and bhaktigeetams have been given a great deal of prominence. This has resulted in the general impression that classical music means devotional music. Only when it is freed from such notions will classical music be able to spread its wings and be enjoyed by more people,” asserts Janardanan. On the limitations faced by instrumentalists, Janardanan says, “A kriti is usually written with vocal music in mind. The range of the instruments like the veena, violin or the flute is not taken into account. An instrument can go through different sthayis and appropriate sruthis. Most of the kritans end in madhya sthayi. Janardanan, who holds Ronu Majumudar in high esteem, has brought out two albums recently – Madhava Murali and Swati Murali. The music moves gently through the air ,transporting the listeners to a world of bliss.